Home - The Douglas Brothers Foundation Inc. 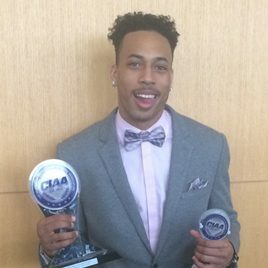 The Douglas Brothers Elite gets CIAA Rookie of the Year Quincy January from St August College. January is a very under rated player who displayed his talent in his first year of college. Mr. Douglas stated that the sky is the limit for Quincy and he is a great student and person. 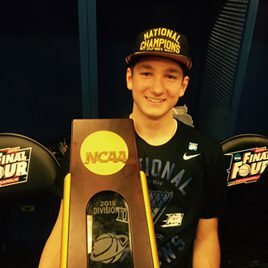 Grayson Allen displayed his talent Monday night on the biggest stage in college- NCAA Championship Game Duke VS Wisconsin in Lucas Oil Stadium in Indianapolis, IN. Three years ago Mr. Douglas discovered Allen in little gym in Jacksonville, FL. Mr. Douglas believed in Allen’s talent and asked his father to let Allen come to Atlanta to play for the Douglas Brothers Elite. The rest is history and Grayson always had dreams of playing at Duke. Grayson has always displayed that he is top flight athlete. Jonesboro High School graduate Austin Donaldson commits to Georgia State University Panthers. 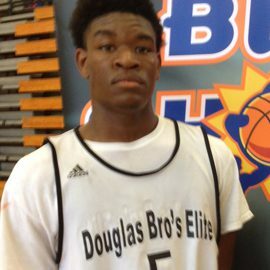 Douglas Brother Elite where Donaldson obtained his athletic name stated he is very excited staying home to play where his family is able to see him play. Donaldson stated he gives Mr. Douglas and the Douglas Brothers Foundation for all the support and making the investment for him to be successful. Mr. Douglas stated that Austin Donaldson was one of the best players he has coached and an he will be successful in whatever he do. Austin Donaldson of Jonesboro High School and Nicolas Wells of Walton High School played at an elite level this past spring and summer with The Douglas Brothers Elite. The players showed that they are some of Georgia’s top players. Point Guard-Austin Donaldson maybe the best point guard in Georgia. He is in the running for Georgia Mr. Basketball. Donaldson has great size, can score and a plays great defense. He is an unselfish player that led Jonesboro High to a 4-A State Championship in 2014. Donaldson has signed to play with University of Tennessee Chattanooga and he will play for the MOCS and Coach Wade. Nicolas Wells has signed with Air force Academy. Wells has much upsize and potential. He is a big sleeper in Georgia. He played very well this past spring and summer. Wells is a 2-3 who is long and athletic with untapped potential. 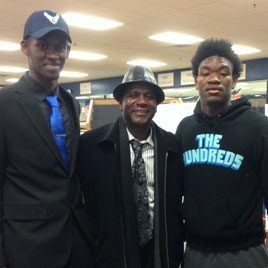 Coach Douglas stated both schools are getting two great young men, which are two of the finest athletes he has coached. Donaldson and Wells both carry a 3.7 GPA and scored well on the SAT. They are truly student athletes and role models for the next generation of children, stated Coach Douglas. IN CONSIDERATION of being permitted to participate in any way in The Douglas Brothers Foundation, Incorporated Prep Stars Sports Academy, I or my legal guardian or parent, for myself, my personal representatives, assigns, heirs, and next of kin: 1. ACKNOWLEDGE, agree, and represent that I understand the nature of the Prep Stars Sports Academy Program and activities and that I am qualified (in age and health), in good health, and in proper physical condition to participate in such Prep Stars Sports activities. I further agree and warrant that if at any time I believe conditions to be unsafe, I will immediately discontinue further participation in the mentioned activities. I also acknowledge their subsidiaries, affiliates and advertising agencies (“companies”) of myself and/or my child’s name, photographs and identity in various TDBF website and collateral material, as well as miscellaneous print publications and other media outlets, and any personal information that I supply to Companies, in connection with advertising and promotion of the Companies and/or their products in any media. 2. FULLY UNDERSTAND that: (a) SPORT ACTIVITIES MAY INVOLVE RISKS AND DANGERS OF BODILY INJURY, INCLUDING PERMANENT DISABILITY, PARALYSIS, AND DEATH (“RISKS”); (b) these Risks and dangers may be caused by my own actions or inactions, the actions or inactions of others participating in the Activity, the condition in which the Activity takes place, or THE NEGLIGENCE OF THE “RELEASEES” NAMED BELOW; (c) there may be OTHER RISKS AND SOCIAL AND ECONOMIC LOSSES either not known to me or not readily foreseeable at this time; and I FULLY ACCEPT AND ASSUME ALL SUCH RISKS AND ALL RESPONSIBILITY FOR LOSSES, COSTS, AND DAMAGES I incur as a result of my participation or that of the minor in the Activity. 3. HEREBY RELEASE, DISCHARGE, AND COVENANT NOT TO SUE THE DOUGLAS BROTHERS FOUNDATION, INC., their respective administrators, clients, directors, agents, officers, members, volunteers, and employees, other participants, any sponsors, advertisers, and, if applicable, owners and lesser of premises on which the Activity takes place each considered one of the “RELEASEES” herein) FROM ALL LIABILITY, CLAIMS, DEMANDS, LOSSES, OR DAMAGES ON MY ACCOUNT CAUSED OR ALLEGED TO BE CAUSED IN WHOLE OR IN PART BY THE NEGLIGENCE OF THE “RELEASEES” AND WAIVER OF LIABILITY, ASSUMPTION OF RISK, AND INDEMNITY AGREEMENT I, or anyone on my behalf, makes a claim against any of the Releases, I WILL INDEMNIFY, SAVE, AND HOLD HARMLESS EACH OF THE RELEASEES from any litigation expenses, attorney fees, loss, liability, damage, or cost which any may incur as the result of such claim. I HAVE READ THIS AGREEMENT, FULLY UNDERSTAND ITS TERMS, UNDERSTAND THAT I HAVE GIVEN UP SUBSTANTIAL RIGHTS BY SIGNING IT AND HAVE SIGNED IT FREELY AND WITHOUT ANY INDUCEMENT OR ASSURANCE OF ANY NATURE AND INTEND IT TO BE A COMPLETE AND UNCONDITIONAL RELEASE OF ALL LIABILITY TO THE GREATEST EXTENT ALLOWED BY LAW AND AGREE THAT IF ANY PORTION OF THIS AGREEMENT IS HELD TO BE INVALID THE BALANCE, NOT WITHSTANDING, SHALL CONTINUE IN FULL FORCE AND EFFECT. AND I, THE MINOR’S PARENT AND/OR LEGAL GUARDIAN, UNDERSTAND THE NATURE OF THE PREP STARS SPORTS ACADEMY ACTIVITIES,AND /OR PHOTOGRAPHS , MEDIA AND THE MINOR’S EXPERIENCE AND CAPABILITIES AND BELIEVE THE MINOR TO BE QUALIFIED, IN GOOD HEALTH, AND IN PROPER PHYSICAL CONDITION TO PARTICIPATE IN SUCH ACTIVITIY. I HEREBY RELEASE, DISCHARGE, COVENANT NOT TO SUE, AND AGREE TO INDEMNIFY AND SAVE AND HOLD HARMLESS EACH OF THE RELEASEE’S FROM ALL LIABILITY, CLAIMS, DEMANDS, LOSSES, OR DAMAGES ON THE MINOR’S ACCOUNT CAUSED OR ALLEGED TO BE CAUSED IN WHOLE OR IN PART BY THE NEGLIGENCE OF THE “RELEASEES” OR OTHERWISE, INCLUDING NEGLIGENT RESCUE OPERATIONS AND FURTHER AGREE THAT IF,DESPITE THIS RELEASE, I, THE MINOR, OR ANYONE ON THE MINOR’S BEHALF MAKES A CLAIM AGAINST ANY OF THE RELEASEES NAMED ABOVE, I WILL INDEMNIFY, SAVE, AND HOLD HARMLESS EACH OF THE RELEASEES FROM ANY LITIGATION EXPENSES, ATTORNEY FEES, LOSS LIABILITY, DAMAGE, OR COST ANY MAY INCUR AS THE RESULT OF ANY SUCH CLAIM. You may submit registration and payment on line or make check or money order for registration fee payable to Douglas Brothers Foundation and mail to P. O. Box 16994, Atlanta, GA 30321. © 2018, The Douglas Brothers Foundation Inc.. All Rights Reserved.